Of all the reptiles I worked with while I was the secretary of a "Creature Club" which dispelled misinformation about our cold-blooded friends, ball pythons were my favorite. In particular, Calypso, the pastel ball python, was my most adored reptilian friend. Calypso was very young when we first got her, and was donated to our club by a rescue organization. While in her cage, she would often lurk underneath her log or hide between her makeshift foliage and the water bowl. She was very shy when it came to strangers, and initially I was frightened to touch her. I had never actually held a snake prior to Calypso, and though I loved reptiles, it was quite an awe-inspiring experience for me when I finally felt her tough body wind around my hand. Once Calypso grew to trust me, she was very friendly and active. She would slide up the side of the cage whenever I came to let her out, and seemed to enjoy wrapping herself around my neck like a piece of jewelry. 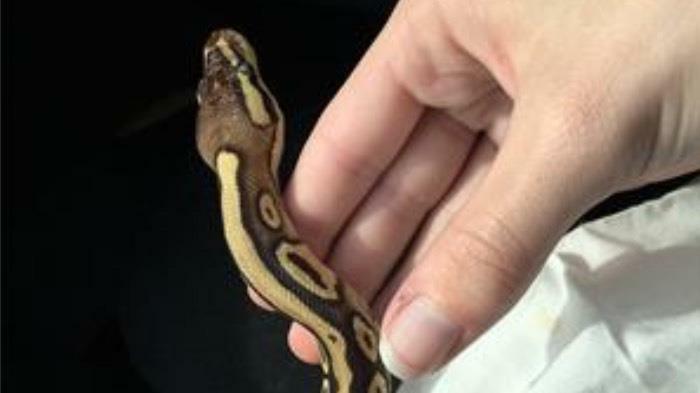 She was very calm and well-behaved during our presentations to kindergarteners regarding the celebration, rather than demonization, of snakes, and allowed all of the small children to (with one finger, and following the direction of her scales) pet her. Calypso has never expressed aggression towards me or any member of our staff, and has always eaten her food with vigor and enthusiasm. Like any snake, Calypso needed certain requirements in order to thrive in her pseudo-environment. She was housed in a terrerium with many spaces to hide herself; the cold half of the terrarium was kept between 77-80 degrees fahrenheit, and the warm half between 87-90. Unfortunately, ball pythons are escape artists, and Calypso was no exception. In order to keep her from escaping the enclosure, it was imperative to make sure that the lid was closed each time after handling her and that all gaps were sealed. To our dismay, an irresponsible club member in charge of Calypso over the summer forgot to take such precautions, thus causing one of our most beautiful and inquisitive snakes to be lost. It was truly a shame, but a testament to how important secure enclosures and careful owners are when keeping ball pythons.